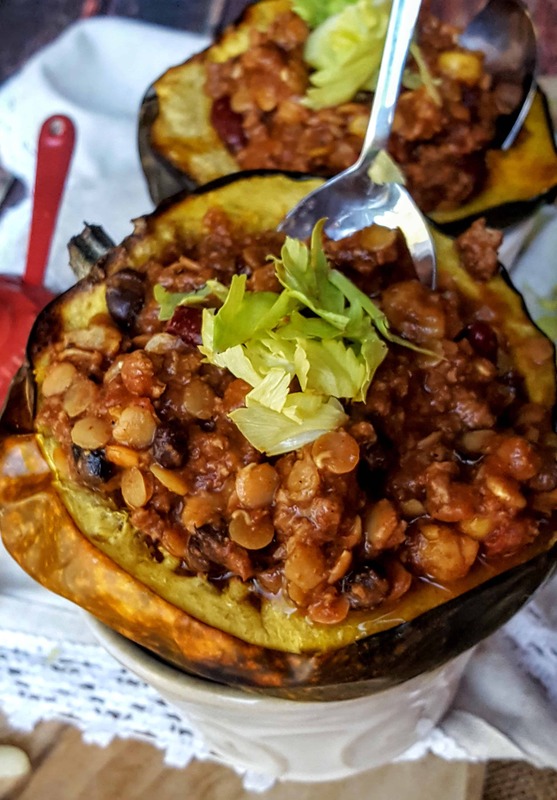 Hang on tight friends, this Red Lentil Chili in an Acorn Squash is about to blow.your.mind! I’ll keep it short and sweet because I’m recognizing more than ever, life is short and you need to live every moment to the fullest! Wise words a woman very close to me echos still in my heart. Now, why this Red Lentil Chili? For The Recipe ReDux that’s why! Packed with protein, fiber and color, plant power bowls are trendy and delicious. Show us the healthy recipe that’s in your bowl. So, naturally, chili came to mind and then acorn squash was on sale and the magic just happened! This recipe is easy, simple and totally delicious. I promise you, if you make this now, you can enjoy the little moments more often all week long. Brilliant, I know! This warm, comforting bowl of goodness is packed with fiber, flavor and a whole lot of love! Perfect for those long, cool winter nights. In a large pot over medium-high heat, add the oil and saute onions and bell peppers together for about 3 to 5 minutes. Add in the jalapeno and garlic, stir. Add the canned tomatoes, sauce, vegetable broth and red lentils to the pot. Stir in the spices and cover with a lid over low heat for 40 minutes. On a baking sheet, place 4 halves of acorn squash and drizzle with olive oil, salt and pepper. Bake for 40 minutes, or until fork tender. Turn off oven and let squash cool on baking sheet. Meanwhile, remove lid from pot and stir in the canned beans and hominy. Turn heat to medium and stir for 5 more minutes. Remove from heat and add 1 cup of chili into each half of squash. Garnish with celery leaves or cilantro. Recipe makes 10-12 cups of chili. Freeze for up to 3 months or refrigerate for 7 days in a sealed container. Looking for more plant based bowl inspiration? Check out the wonderful Recipe ReDuxer’s options below! « Pregnancy Cravings – The Dish from 30+ Registered Dietitians! Very wise words indeed. Once again, great minds think alike- I love that you used an edible bowl too! 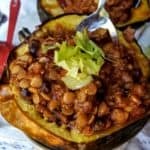 I’m sure the smoky flavors in the chili worked beautifully with the sweet acorn squash! You are the best! Mr. CEO has been obsessed with this chili, he’s asked for it repeatedly since I brought it home from my moms! #forthewin! 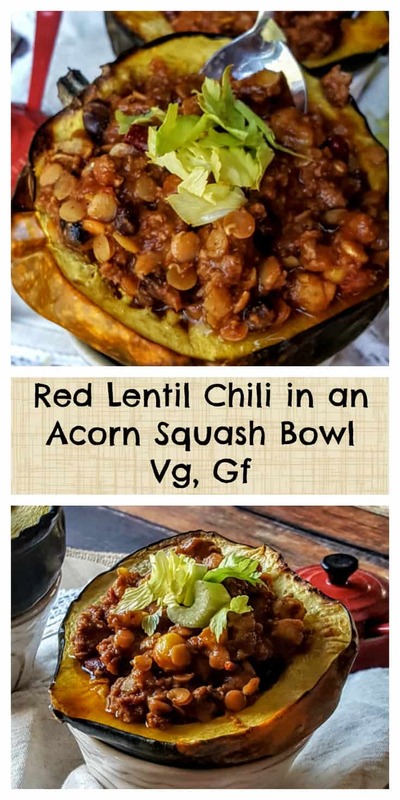 Love this idea of using the squash as a bowl and this chili certainly a great way to get a protein-packed meal! Thanks Lauren- I like to think about it as a hole in one! Love your creative take on the “bowl” theme Liz! Your lentil chili looks divine, and, no doubt, Mr. Spicy would approve too 🙂 Here’s to living every moment to the fullest~cheers!!! Looks delicious, can’t wait to try this!! Thank you sweet Mandy!! Miss you!! How many red lentils are supposed to be in this recipe? The quantity is not listed. Thanks! Hi Maria! The recipe indicates 1 cup dried red lentils! Let me know if you have further questions. Hope you enjoy! The perfect Fall dish! These flavors sound so so good together, and satisfying! This did blow my mind!! Such a great recipe, thanks! Just made this because I wanted to use up some of my red lentils in the cabinet and it did not disappoint!! It made a ton too so now i have leftovers for the week! So glad you liked this! 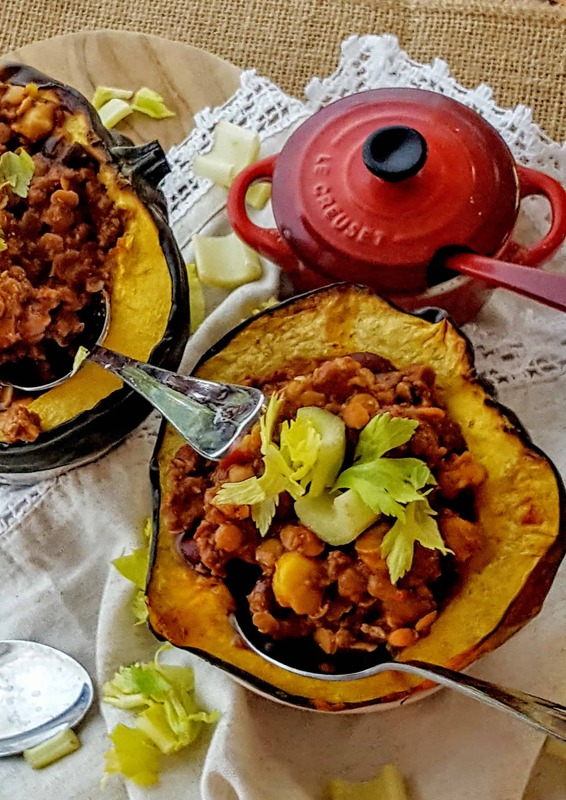 Truth: lentil chili made but not acorn squash. Yes. I’m that lazy. But it was so good!!! LOL you do you girl! Definitely making this soon. I love stuffed squash!